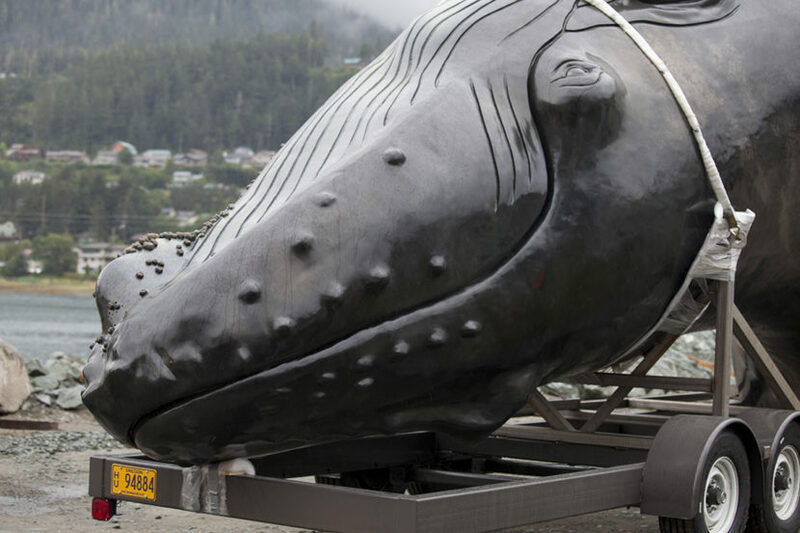 Juneau’s 6-ton, 25-foot-tall whale statue has arrived. At least, the body has. 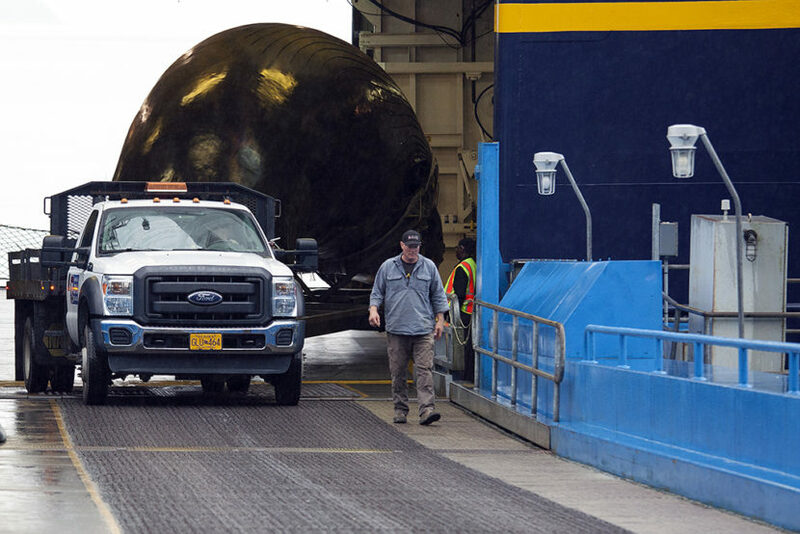 The life-size, bronze humpback whale sculpture came in by ferry early Monday morning. 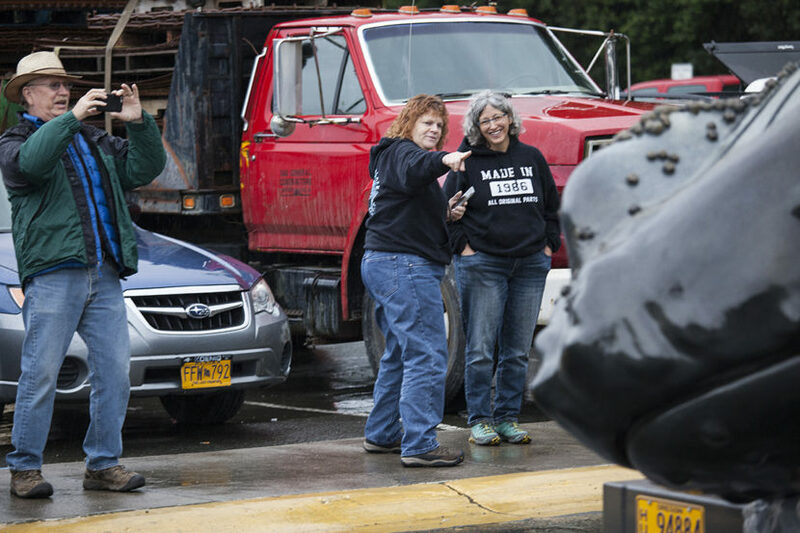 Sculptor R.T. “Skip” Wallen and several members of The Whale Project, the group that raised money to fund the estimated $2.8 million project, were at the ferry terminal for the whale’s arrival. 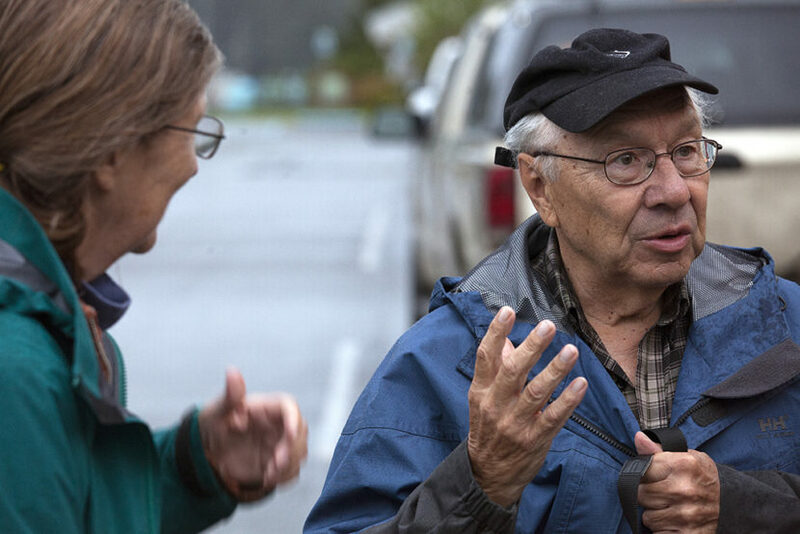 A crowd of about 20 people weathered a light drizzle waiting for the sculpture’s arrival at Auke Bay. 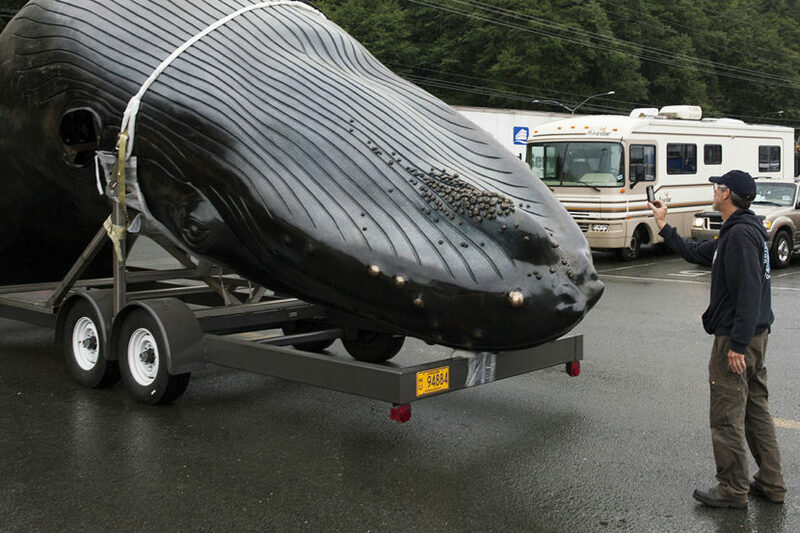 After passengers disembarked, a dual-wheeled truck hauled the flatbed trailer with the whale out of the ferry. As the whale was pulled from the ferry, spectators cooed with oohs and aahs. 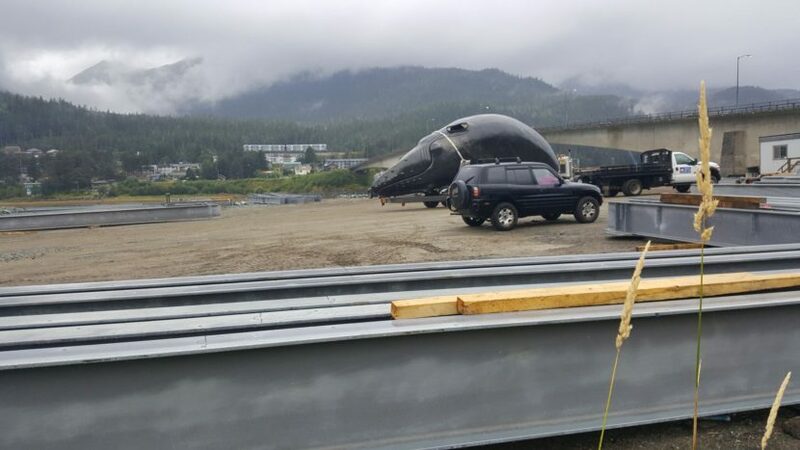 The truck stopped for a brief moment as Wallen, members of The Whale Project, and others posed for photos before the truck headed inbound to its future home near Douglas Bridge. Onlookers included Bill Overstreet Jr. and his wife, Carol, up from Oregon Hill, California. Bill’s father was former Juneau Mayor Bill Overstreet Sr., who conceived the idea during a trip to Japan in the 1980s. The whale statue is part of the Overstreet legacy, but it’s also been a sore subject for fiscal conservatives and the cruise ship industry. 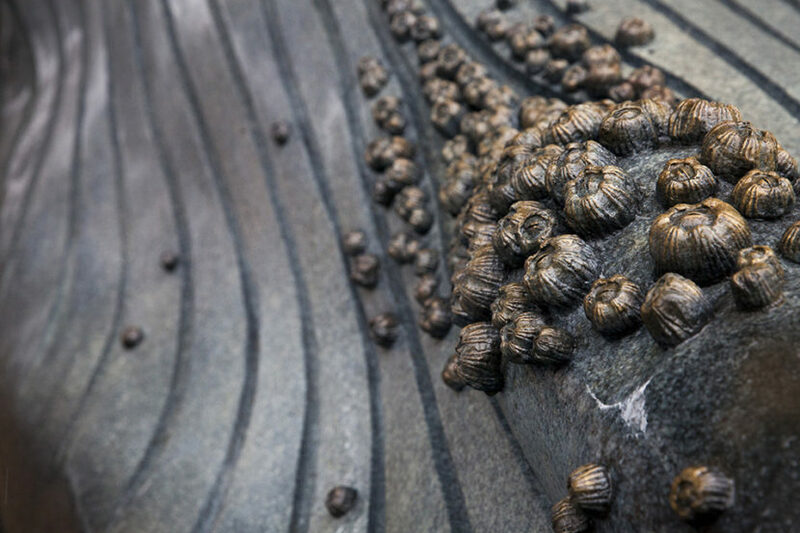 Cruise ship passenger fees are covering the cost of a$10 million waterfront park and reflecting pool where the whale sculpture will be installed near the Douglas Bridge. 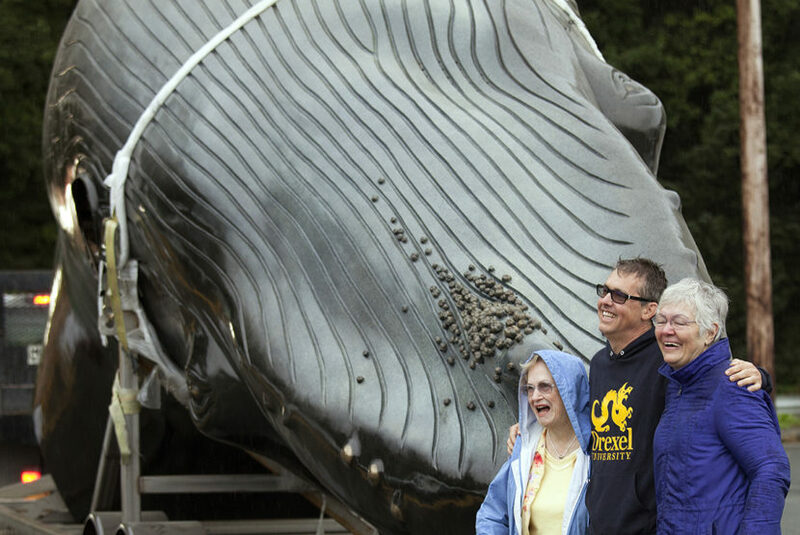 The industry sued the city in April and cited the whale statue park as an example of misuse of the passenger fees. Under federal law, cruise ship head tax money must be spent to benefit ships and their passengers. The fins are expected to arrive Tuesday. Someone from the foundry is expected Aug. 17 to weld the fins on.